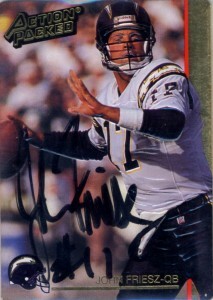 John Freisz was drafted by the San Diego Chargers in the 6th round of the 1990 draft. Considered to be the ‘future’ of the franchise- based on his amazing performance at Idaho leading them to an 8-0 record and throwing for over 4,000 yards- the future came sooner than anybody expected when Billy Joe Tolliver left after the season concluded. 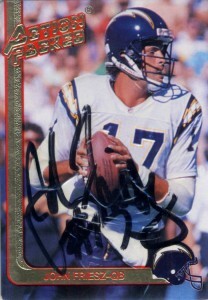 In 1991 Friesz took over as starting quarterback of the Chargers, starting all 16 games. Allowed to flourish- he threw for 2896 yards and 12 touchdowns as a traditional drop back passer. Friesz suffered a season ending injury in the 1992 preseason and did not return until 1993, throwing 6 touchdowns and only 4 interceptions. A new head coach led John in a new direction- as John became a journeyman quarterback, playing in Washington for a season, before a four season stint with Seattle starting in 1995. In 1996, (John’s best year,) he’d win 4 starts and lose only 2 putting up a respectable 86.2 quarterback rating. In 1995, he came off the bench for the Seahawks leading the team back from a 20-0 deficit against the Denver Broncos- engineering 3 4th quarter touchdown drives. After his stint in Seattle, Friesz would play two non-discript seasons for the New England Patriots and retire. Friesz was the epitome of the walking wounded. Over his career he broke his thumb, leg, suffered injuries to his knees and separated his non-throwing shoulder. He also spent 15 games of his rookie season on IR, and the whole 1992 season there as well. John was well liked by his teammates. With a workman like attitude and a team player, Friesz rarely if ever complained when salary cap problems, politics and injuries caused him to lose his starting job. An avid outdoorsman, John especially enjoys fishing and is a certified Scuba diver. John’s last name is pronounced “Freez” and was nicknamed “Deep” by his teammates in college. In 2006, John’s number was retired by Idaho and he became the school’s first inductee into the College Football HoF that year as well. In 2009 he’d also be inducted into the Inland Northwest HoF. He remains active to this day in his community participating in golf tournaments, hosting numerous charities for the Special Olympics and participating in Big Brothers & Big Sisters of America. There were some incredible Nebraska teams over the years, and Mike Rozier was one of those immense talents coming out of college that was a surefire pick. The 1983 Heisman Trophy winner, he’d go pro in 1984- but throw the NFL for a loop jumping to the USFL and be signed by the Pittsburgh Maulers. He’d amass 792 yards and 3 touchdowns on 223 carries his rookie season. Tempted to jump back to the NFL, Rozier would resign and play for the Jacksonville Bulls in 1985 crushing opponents for 1361 yards on 320 carries. He’d also chock in 12 touchdowns. 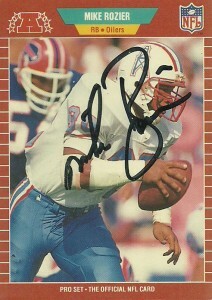 With the USFL crumbling and his rights relinquished to the Baltimore Stars, Rozier would be drafted in the supplemental draft by the Houston Oilers of the NFL with the second overall pick in 1984. The Oilers would finish buying out his contract and he’d make the jump to the NFL. 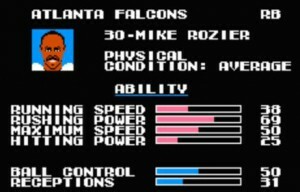 After his rookie season where he played fullback, Rozier would play runningback for the rest of his career from 1986 on out. A great mixture of power and speed, injuries quickly limited Mike’s production in the NFL in an age where arthroscopic knee surgeries were not necessarily a given to rehabilitate players. Rozier would go to the ProBowl in 1987 (957 yards), and 1988 (1002 yards). By 1989 the team was utilizing a runningback by committee approach with Lorenzo White, Alonzo Highsmith, and Allen Pinkett alongside Rozier, but with the departure of head coach Jerry Glanville, Mike would be cut by the Oilers in 1990 after 3 games. He reunited immediately with Glanville who was now in Atlanta and put up 675 yards in 13 games. Seeking a new contract after the season for roughly $1 million, Rozier briefly toyed with the idea of signing with the WLAF’s Birmingham Fire, but with comparatively low salaries- it probably never really entered into a serious negotiation. Mike would get his wish however and resign with the Falcons playing in 11 games and finishing out with 361 yards, but after arthoscopic knee surgery in January of that year he’d soon after announce his retirement. After football, Mike moved back to New Jersey where he was born. Unfortunately in 1995, he was shot in his hometown of Camden where he suffered internal injuries to his liver. 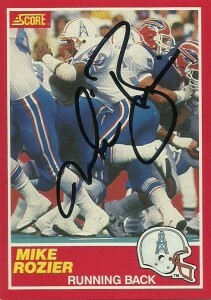 In 2003, he was brought back to Nebraska for a team reunion, and in 2005 Mike was inducted into the Camden sports Hall of Fame and the New Jersey Hall of Fame. Finally, in 2006 Mike Rozier was inducted into the College Football HoF.